Sharon Manning Photography: "Get Your Camera Off Auto" e-Workshop! 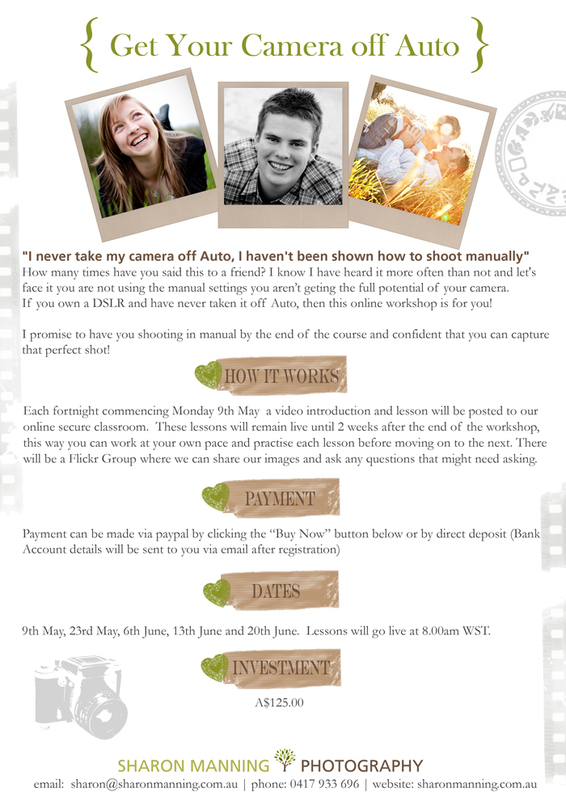 "Get Your Camera Off Auto" e-Workshop! Due to overwhelming demand and interest, I am hosting my "Get Your Camera Off Auto" workshop online! Now everyone will have the opportunity to learn how to use their DSLR on manual and realise the full potential of their camera. I'm very excited to offer this to you, alot of hard work has gone into developing this course in a way everyone can benefit from it, no matter what experience you may have had shooting on manual. I have been wanting to do this for quite a while, and the timing is right for me and quite possibly you too. Registrations are now open for class commencing 9th May (term two or there abouts for most of Australia). All the details are below and please if you have any further queries, then leave a comment or email me if you would prefer. I will answer your questions directly to you and also in a post here on my blog in a couple of days time. I genuinely cannot wait to share my knowledge with you and have some fun along the way......just don't laugh at me in the videos! Once you have signed up don't forget to add your button to your blog.....here's what the button looks like and the code you need is in the right hand bar of my blog here. Thanks and I look forward to welcoming you all on Monday 9th May! Are you able to give a little more information on what you will actually be covering in the course?